Home / Top QuiBidder Contest – What You Need to Know! UPDATE (1-21-2015): The details of this promotion have changed. Go here to learn the latest. November 2013 – These rules have been updated. See new Top QuiBidders Leaderboard post here. Have you ever helped other QuiBidders on our Facebook page? Or perhaps you’ve liked one or two of our posts. Now you’ll be recognized (and potentially rewarded) for your contributions to the QuiBids community! With our monthly Top QuiBidders Leaderboard contest, we aim to reward your customer loyalty and engagement on Facebook. Gameplays and Free Bids are on the line, people! So what exactly is the Top QuiBidders Leaderboard? The Top QuiBidders Leaderboard ranks our fans on Facebook based on the Top QuiBidder Points they’ve received. The Leaderboard will reset at the first of every month at 12:00 A.M. CST and will conclude at 11:59 P.M. CST on the last day of every month. We’ll award QuiBidder Points to customers based on social engagement, such as comments, shares, and likes. QuiBidders can see how they stack up against other customers at any time by viewing the Top QuiBidders application on our Facebook page. More specifics on that below. Click HERE to view the current Top QuiBidders Leaderboard. Sounds easy enough, right? Liking a QuiBids Facebook post earns you a quick QuiBidder Point, but you’re limited to four per day (see Daily Limits below). If your post earns likes or inspires comments, you’ll receive more QuiBidder Points for each additional like/comment. You get credit for one post per day. If your comment engages the community, you’ll receive more QuiBidder Points for each additional like your comment receives. Limited to three comments per day. If you post a photo or video of yourself with a QuiBids win, you’ll receive extra QuiBidder Points, which will be awarded based on creativity and quality. QuiBids reserves the right to decide when and how many additional QuiBidder Points will be awarded. contain spam or are intended to cause technical disruptions to this page. – See more here. Stay on topic and comment only if you have information that’s relevant, helpful, or entertaining to other QuiBidders. Your QuiBidder Points will pile up if the community rallies around you. More points are awarded based on your ability to engage the community and earn likes and comments on your posts. Three comments per day, whether in response to a QuiBids post or a post from other people. One post directly on our wall per day. Four likes on our post or another fan’s post per day. You may still post more than the daily limits, but additional posts above the limits are ineligible for additional QuiBidder Points. If you do something above and beyond (for example, post a photo of yourself with your QuiBids wins, or a video where you talk about your QuiBids wins) or something else exceptional (like, say, train your parrot to say “QuiBids rules!”), you may earn extra QuiBidder Points. We reserve the right to decide when and how many of these additional QuiBidder Points will be awarded. 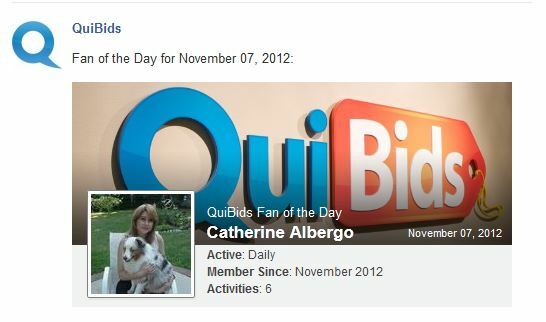 Each day the Leaderboard at the QuiBids Facebook app will select one fan who’s been active recently to receive the Fan of the Day distinction! 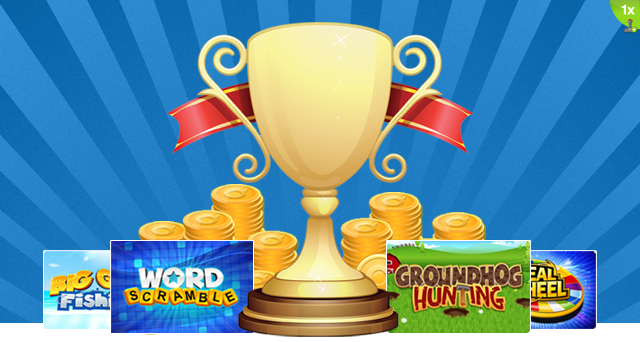 There’s no prize to go along with this, but bragging rights are always fun! Ten (10) people out of the top 25 QuiBidders be chosen at random to win a 2X Gameplay. How are QuiBidder Points calculated? QuiBidder Points are automatically rewarded based on post quality and frequency. Posts are more likely to score points if they are spaced throughout the day, at least two hours apart. Points are given for activity on our page via comments, posts, or likes. More points are given if other fans like or comment on your post, or if you do something exceptional (see Notable Activity above). How long does it take for my QuiBidder Points to update? The time it takes to translate activity into points on the Top QuiBidders Leaderboard will be between four and 12 hours. You might see a slight lag between the time you post, comment, or like, and when your QuiBidder Point total changes. How often can I comment, post, or like? 2X Gameplay: We will randomly select ten people out of the top 25 QuiBidders from the Leaderboard to win a 1X Gameplay. 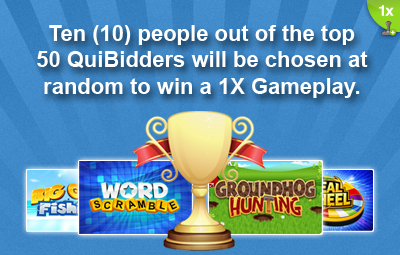 1X Gameplay: We will randomly select 10 people out of the top 50 QuiBidders from the Leaderboard to win a QuiBids T-shirt! 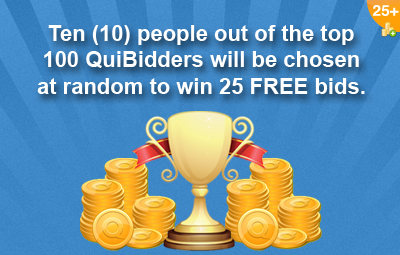 25 FREE Bids: We will select 10 people out of the top 100 from the Top QuiBidders Leaderboard to win 10 FREE bids. The Leaderboard is reset at the end of each month, so you have a new chance to move up in the rankings every thirty days or so. You cannot win more than once per month. What if someone posts over the daily limit or violates QuiBids’ Community Guidelines? It is against QuiBids’ Community Guidelines to post comments with foul language, offensive or personal attacks, or spam of any kind. (Read here for a rundown of good QuiBids social media practice.) If a user violates one of the rules above, they could either lose points or be disqualified for the remainder of the month in addition to being banned from our Facebook page. How are the random winners selected? We use randomizer.org to select a winner at random from all eligible QuiBidders. How do I get QuiBidder Points? Posts, comments, and likes are all worth one QuiBidder Point. See How to Earn QuiBidder Points above. NO PURCHASE NECESSARY TO ENTER OR WIN. See official rules and other legal stuff here.